The mortality of nursery-grown beech (Fagus sylvatica L.) seedlings after out planting into the field is usually high. The goal of this study was to characterize the response of beech seedlings to planting stress and to test if soil amendment with a mixture of hydrogel and the ectomycorrhizal fungus Paxillus involutus could rescue the establishment of stressed plants. For this purpose, bare-rooted, dormant seedlings were exposed for 0, 2 and 6 h to air before planting. Water loss in response to air exposure caused increasing concentrations of soluble carbohydrates in buds and fine roots suggesting only passive of osmoprotection. Short-term exposure for 2 h delayed bud burst in spring, whereas long-term stress for 6 h also increased mortality. Growth of the seedlings in amended soil improved plant performance compared with plant grown in untreated soil. In particular, mycorrhizal colonization, plant water status and biomass increased, whereas carbohydrate storage pools were decreased. Total plant nitrogen allocated to leaves but not the nitrogen or carbohydrate concentrations were correlated with the degree of ectomycorrhizal colonization. This suggests that soil amendment enhanced nitrogen uptake via ectomycorrhizals, which in turn stimulated growth, thereby, increasing carbon consumption and preventing starch accumulation. In conclusion, soil amendment with hydrogel and an ectomycorrhizal fungus significantly improved the performance of both stressed and unstressed young beech trees. Dedicated to the memory of Aloys Hüttermann, a pioneer in hydrogel research. European beech (Fagus sylvatica L.) is the potentially dominating tree species of the natural vegetation in Central Europe (Ellenberg 1992). In the past, reforestation in many European areas was mainly performed with conifers. 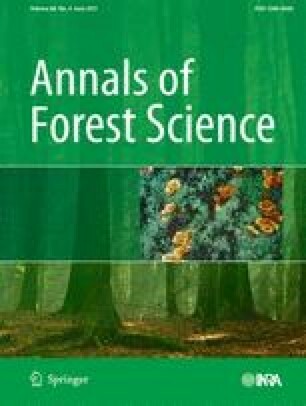 One of the most important aims of the current forest silvicultural programs in Germany is to transform monocultures of conifers into mixed forests with beech (Tarp et al. 2000). When nursery-grown seedlings are out planted, the mortality can be as high as 60% in the first year (McKay 1997). Growth of the surviving seedlings is often poor. Possible reasons for these high losses and poor quality are frequently related to inadequate treatment of the planting stock during transfer from the nursery to the field site exposing the roots to air, thereby imposing drought stress (McKay 1997). For successful field establishment, seedlings have to overcome the transplanting shock, which is primarily caused by desiccation (Girard et al. 1997a, b; McKay et al. 1999; Apostol et al. 2009). Beech seedlings were particularly sensitive to air exposure of the roots after lifting the plants from the nursery bed showing increased mortality compared with other European forest tree species (McKay et al. 1999). Hydrogels have been successfully employed to increase tree vitality and reduce mortality during drought (Metzger and Hüttermann 2009). Hydrogels are water-retaining polymers that can absorb water about 100 to 150 times their own weight. A significant fraction of this absorbed water is available to plants and thus, acts as an additional water reservoir for the soil–plant–air system (Bhardwaj et al. 2007). The ameliorative effect of hydrogels for osmotically stressed tree seedlings is well documented in Pinus (Hüttermann et al. 1999), Eucalyptus (Viero et al. 2002), Citrus (Arbona et al. 2005), Quercus (Apostol et al. 2009), and Populus (Chen et al. 2004; Luo et al. 2009a; Beniwal et al. 2010; Shi et al. 2010). Mycorrhizal fungi, which form mutualistic interactions with plant roots, can also improve water availability to plants (Smith and Read 2008). Inoculation with mycorrhizal fungi improved seedling performance after out planting (Pinior et al. 2005) and conferred higher desiccation tolerance to the host plant (Beniwal et al. 2010). In a controlled experiment, the inoculation with both hydrogel and the ectomycorrhizal fungus (EMF) Paxillus involutus was more efficient in preventing drought-induced injury than single treatments with either the fungus or hydrogel (Beniwal et al. 2010). However, it is unknown whether this mixture is also suitable to ameliorate the performance of plants, which are already drought-stressed as in the case of air-exposed beech seedlings after lifting from the nursery bed. In the present study, we examined the performance of young beech trees (F. sylvatica L.) immediately and during the following season after planting stress imposed by air exposure of bare-rooted seedlings. The objective of this study was to determine if soil amendment with a hydrogel–EMF mixture might reduce plant mortality and enhance biomass production. We hypothesized that soil amendment increases soil water availability and facilitates mycorrhizal colonization, thereby, improving plant nutrition and biomass production. One-year-old bare-rooted beech seedlings obtained from a nursery (Forstbaumschule Billen, Bösinghausen, Germany) in October were transported within 20 min to the experimental field in a common garden (Forest Botany, Georg August University, Göttingen, Germany) and were immediately planted. In the following spring before bud break (8th and 9th of March), the seedlings were selected on the basis of similar stem diameters and excavated carefully. The soil from the roots was gently washed off and drip water was removed. These bare-rooted seedlings were exposed on a wire mesh to air in an acclimatized growth room (20°C, 50% relative air humidity) for 0, 2, and 6 h under full light illumination (250 μmol photons per square meter per second). One batch of seedlings (n = 10) was harvested for the determination of biometric parameters and carbohydrate concentrations in roots and buds after each treatment, and the remaining plants (30 per treatment) were planted into untreated or amended soil (preparation see below) outdoors in replicated plots. During the growth season, weeds were controlled manually. No additional fertilization was applied to the seedlings. The plants were irrigated as necessary. The elemental composition and pH of the experimental plots were determined at harvest by analyzing soil from amended and untreated plots by inductively coupled plasma optical emission spectrometry (Spectro Analytical Instrument, GmbH, Boschstrasse, Kleve, Germany, as described by Heinrichs et al. 1986). No differences were found. The pH was 7.3 ± 0.1, and the element concentrations were (grams per kilogram dry soil): K, 5.9 ± 0.1; Ca, 20.4 ± 2.7; Mg, 4.7 ± 0.1; Fe, 16.6 ± 0.7; P, 1.4 ± 0.1; S, 0.96 ± 0.26; and those of trace elements (milligrams per kilogram dry soil): Mn, 462 ± 3; Zn, 120 ± 3; Cd not detected; Co, 6.7 ± 0.1; Cr, 37.0 ± 0.7; Ni, 24.5 ± 0.5; Pb, 32.5 ± 1.0. The concentrations of heavy metals (Cd, Cu, Ni, Pb, and Zn) in soil were below the threshold limit set by the Council of the European Communities (1986). P. involutus (Bartsch.) (strain MAJ in the Göttingen stock collection) was grown on 0.5 modified Melin-Norkrans agar medium [0.50 g KH2PO4, 0.25 g (NH4)2HPO4, 0.15 g MgSO4·7H2O, 0.05 g CaCl2·2H2O, 0.025 g NaCl, 1 ml thiamine HCl (0.1%), 1.2 ml FeCl3·6H2O (1%), 2.5 g glucose, 5.0 g malt extract, 10.0 g agar per 1 L of distilled water] on cellophane for 4 weeks (after Gafur et al. 2004). For the liquid culture, agar and malt extract were omitted from the medium. P. involutus mycelium taken from the agar plates was incubated in an acclimatized room (22°C, 67% relative air humidity) for 2 weeks on a rotary shaker (100 rpm) in 100 ml 0.5 modified Melin-Norkrans medium with low sugar content (2 g glucose) without malt extract and agar. The mycelium from the 100 ml 0.5 modified Melin-Norkrans medium was collected in 500-ml flasks and homogenized three times for 3 s at 8,000 rpm (Ultraturrax, IKA, Jahnke & Kunkel, Staufen, Germany). Amended soil was prepared by mixing 1 kg soil (32% moisture) with 45 ml of the homogenized liquid culture of fungal inoculum and 5 g of hydrogel (Stockosorb K400, Stockhausen, Krefeld, Germany). Each seedling was planted with 1 kg of untreated or amended soil into the field. The length of the leader shoot, stem diameter at the root collar, seedling mass, number of buds, and carbohydrates in buds and fine roots were determined before planting (8th and 9th of March) and at harvest (18th and 19th of August). During air exposure of the bare-root seedlings, the relative weight loss was determined as: weight loss (%) = (fresh mass before air exposure − fresh mass after air exposure) × 100/fresh mass before air exposure. After planting, the bud burst and mortality were scored regularly. A tree was scored as flushed when the first leaf appeared at the top of the bud. Trees were considered dead when no leaves were formed within 3 months after planting. At harvest, leaves and buds were counted on all trees per treatment. The trees were divided into different tissues (fine roots, coarse roots, stem and branches, leaves). Aliquots of fine roots and leaves were shock-frozen in liquid nitrogen and stored at −80°C. Fresh and dry biomass (after drying at 60°C) were determined separately for each tissue. The actual water content (percent) was calculated as follows: AWC = 100 × [(fresh mass − dry mass) × fresh mass−1]. To determine the whole plant leaf area, five leaves (sample leaves) of five trees per treatment were weighed and scanned. The leaf area was calculated as: (leaf area of sample leaves × fresh mass of whole plant leaves)/fresh mass of sample leaves. The potential quantum yield of photosystem II (PS II) was measured in the first week of August in darkness predawn using a portable pulse-amplified modulation fluorometer MINI-PAM (Walz GmbH, Effeltrich, Germany). The quantum yield of PS II was determined as Φ = (F m − F 0)/F 0 (after Schreiber et al. 1986). Roots (eight plants per treatment) were spread in Petri dishes with distilled water, and EMF colonization was determined by counting a minimum of 300 lateral root tips per plant under a dissecting microscope (Zeiss, Stemi, Göttingen, Germany). EMF colonization of root tips was detected by the formation of a hyphal mantle as reported previously (Lang et al. 2010). EMF colonization was calculated as EMF (%) = (number of EMF root tips/number of total root tips) × 100. Various morphotypes were detected but not further analyzed. The root tips of the young beech tree obtained from the nursery were generally 29 ± 4% colonized by EMF. EMF was also analyzed in cross sections that were embedded and analyzed as described previously (Langenfeld-Heyser et al. 2007). Frozen plant materials were ground with mortar and pestle in liquid nitrogen and extracted in DMSO/25%HCl (80/20, v/v). The concentrations of glucose, fructose, sucrose, and starch were analyzed enzymatically (Schopfer 1989). Starch was quantified after degradation by amylogucosidase (Fluka, art. no. 10115, 125 U/mg, FLUKA BioChemika, Buchs, Swisse) into glucose (Beutler 1978). Dry leaf tissue was ground to a fine powder, weighed into in 5 × 9-mm size tin cartridges (Hekatech, Wegberg, Germany) and was analyzed in a CHNS–O elemental analyzer (CHNS–O EA-1108 Elemental Analyzer, Carlo Erba, Milano, Italy). The standard used was acetanilide (71.09% C; 10.36% N; Carlo Erba, Milano, Italy). Data are means (±SE). Data were tested for normality and subjected to analysis of variance followed by Tukey’s HSD test (P ≤ 0.05) to determine significant effects of air exposure and soil amendment. Statistical procedures were carried out with the Software Package SAS (SAS Institute Inc., Cary, NC, USA, ©1989–2003). We selected young trees of similar plant height, stem diameter, root-to-shoot ratio, number of dormant buds, and biomass in March for the experiment (Table 1). None of the biometric parameters was affected by the exposure of the bare-rooted seedlings to air for 2 h or 6 h (Table 1). However, the simulated planting stress caused significant losses of whole plant actual water content (AWC) (Table 1). To find out if planting stress influenced root and bud metabolism, we measured the AWC of these tissues and their carbohydrate concentrations. In both tissues, strong decreases in the AWC were found (−30% in buds and −60% in fine roots, Table 1), which caused significant accumulations in the concentrations of soluble carbohydrates on a fresh mass basis. The sum of fructose, glucose, and sucrose increased from 191 to 260 in the buds and from 60 to 99 μmol g−1 fresh mass in fine roots (P < 0.01). However, the soluble carbohydrates remained unaffected on a dry mass basis (Table 1). The starch concentrations also remained unaffected (means in buds, 49 ± 7 μmol glucose equivalents per gram dry mass (DM) and in roots, 53 ± 6 μmol glucose equivalents per gram DM). Therefore, we conclude that the accumulation of sugars in the tissues was a passive process and not due to active production of osmolytes. To test the field performance of young beech trees after planting stress and to find out if soil amendment by a mixture of hydrogel–EMF can ameliorate negative effects of extended air exposure of bare-rooted seedlings, we determined the time point of bud burst, mortality, PS II activity, and growth parameters. Bud burst in unstressed beeches started about 6 weeks after planting, and all the trees were flushed within 1 week regardless of the presence or absence of amended soil (Fig. 1). Air exposure of 2 h resulted in a delay of bud burst; all the plants were flushed within 1 month (Fig. 1). After air exposure of 6 h, the vitality was strongly reduced since the plants showed a delay of almost 1 month compared with unstressed trees before they started with bud burst; about 90% of plants were flushed within 2.5 months (Fig. 1). Stressed beeches grown in amended soil showed a delay in bud burst compared with those grown in untreated soil (Fig. 1). Planting stress imposed by exposure of bare-rooted seedlings to air exposure for 6 h had significant negative effects on subsequent growth. The increment in stem diameter and leader shoot growth as well as the total plant leaf area, the number of leaves, and the number of newly formed dormant buds were about two- to threefold lower than those of unstressed plants (Table 2). After severe planting stress, biomass production was also severely impaired (Fig. 2). These reductions were not caused by the impairment of photosynthesis since the PS II activity of the leaves was unaffected by all treatments (quantum yield of dark-adapted leaves, 0.778 ± 0.007). The effects of short-term air exposure of 2 h were generally insignificant (Table 2; Fig. 2). The presence of amended soil caused significant growth stimulations of all parameters analyzed, despite delayed bud burst (Table 2; Fig. 2). Regression analysis revealed a tight correlation between the biomass of fine roots and leaf area (Fig. 3). To characterize the ameliorative influence of soil amendments on unstressed and stressed beeches, mycorrhizal colonization as well as the plants’ levels of nitrogen and carbohydrates were investigated. The soil amendment resulted in significant increases in mycorrhizal colonization of the root tips (Fig. 4a). As various morphotypes were observed (not documented), the effect was not specific for P. involutus. Soil amendment also improved the water status of the fine roots compared with beech grown without soil amendment in controls and in short-term stressed plants (Fig. 4b). At the whole plant level, trees grown in amended soil also displayed higher AWC (60.5% versus 57.0%, P = 0.012). Notably, planting stress also had long-term effects on EM colonization since the relative abundance of EM on root tips of 6-h-stressed plants was still lower than on those of unstressed plants (Fig. 4a). Anatomical analyses showed that EMF root tips were structurally intact, whereas non-EMF had a distorted appearance. These anatomical differences were observed regardless of preceding planting stress or not (not shown). Preceding planting stress had no influence on the carbohydrate status of fine roots in fall (Table 3). However, growth in amended soil caused significant reductions in both soluble carbohydrates and starch (Table 3). Leaves of these plants also contained less soluble carbohydrates and starch than leaves of plants grown in untreated soil (Table 3). The overall starch concentrations in leaves were much lower than those of fine roots. Since EMFs are also known for their beneficial effects on plant nutrition, we determined the nitrogen concentration of the leaves. However, no significant effect of any of the treatments was found (21.4 ± 1.8 mg N g−1 DM). Soil amendment stimulated leaf formation (Table 2; Fig. 2), and as a consequence, the whole nitrogen content in total leaf biomass increased. This increase was strongly correlated with EMF colonization (Fig. 5). The main objective of this study was to test if soil amendment improved the performance of young beech seedlings after plant stress. We observed in line with previous studies (Girard et al. 1997a; McKay et al. 1999; Yu et al. 2003; Jacobs et al. 2009) that air exposure immediately caused significant water loss of the plants although they were still in the dormant stage with fully closed buds. Bare-rooted beech plants are very sensitive to desiccation (McKay et al. 1999). Still, our study indicates that water loss of about 14% is tolerated without a major decline in biomass production. However, the timing of root lifting is also critical and makes it difficult to compare different studies directly (Lindqvist 2001; Goodman et al. 2009). Our data indicate that beech was not able to actively increase carbohydrates since the tissue concentrations were stable on a dry mass basis. Nevertheless, the concentrations of solutes in the liquid phase increased because of the initial massive water loss. As solutes act as osmoprotectants limiting water loss (Rennenberg et al. 2006; Fischer and Polle 2010), the increasing concentrations on fresh mass basis might have decelerated water loss. Indeed, on the whole plant level, trees initially lost about 7.4% of their weight per hour, whereas the weight loss leveled down to 1.2% per hour in the time period between 2 and 6 h of air exposure. Although the mortality of 6-h-stressed plants was low (about 10% after 6 h of air exposure), their productivity was strongly diminished. One reason was severely delayed bud burst, which has also been observed for other tree species stored with bare roots (Girard et al. 1997b) and which may be the result of increased carbohydrate consumption and depletion of storage pools during recovery from air exposure. Furthermore, the number of leaves that emerged and the number of buds formed for the next season was much lower than in unstressed plants. It is, therefore, unlikely that stressed plants with low vitality would survive in the long run under field conditions in competition with other plants. Positive effects of both hydrogels and EMF on plants exposed to drought stress are well documented (Hüttermann et al. 1999; Viero et al. 2002; Chen et al. 2004; Arbona et al. 2005; Pinior et al. 2005; Luo et al.. 2009a, b; Beniwal et al. 2010). Recently, it was shown that root dipping into hydrogels after root lifting also improved the performance of plants during an extended period of air exposure (Apostol et al. 2009). Our present data document that soil amendment with a hydrogel–EMF mixture significantly improves seedling establishment. Although the plants in our study were watered, daily fluctuations in soil water content usually cannot be avoided. Hydrogels increase the water retention capacity of the substrate, thereby, alleviating fluctuations in water availability (Bhardwaj et al. 2007). Overall, soil amendment increased the plant water status, and this may have facilitated plant establishment. EMFs increase plant nutrient availability and protect root tips from various stresses but consume plant-derived carbohydrates (Nehls et al. 2010). The beneficial effect of soil amendment may also have been caused by an increased EMF colonization since the cortex cells of nonmycorrhizal beech roots were distorted (not shown), which has been reported to affect their physiological activity (Winkler et al. 2010), while the intrinsic structures of EMF root tips had a healthy appearance. As some EMFs are very sensitive to drought (Querejeta et al. 2009), we cannot exclude direct negative effects of air exposure on EMF vitality. It is, therefore, possible that soil amendment containing EMF inoculum compensated direct negative effects of air exposure on the preexisting EMF. Since the EMF colonization of beech roots depends on recent carbohydrate supply (Druebert et al. 2009; Pena et al. 2010), it is also possible that the reduction of EMF colonization of stressed plants was a consequence of impaired belowground carbohydrate allocation. When beech was limited in growth by shading, EMF colonization was low, despite the presence of carbohydrate storage in roots (Druebert et al. 2009). Similarly, we found here normal starch and soluble carbohydrates in fine roots regardless of whether the plant had experienced preceding planting stress or not, but growth in amended soil caused significant decreases in carbohydrates, probably because of sink stimulation due to increased plant biomass production and because of the carbon consumption of root-associated EMFs. In return, these fungi increase the surface for nutrient absorption, thereby, enhancing total N uptake. In conclusion, our study supports that beech is sensitive to extended exposure of bare-rooted seedlings to air. We showed that desiccation caused passive carbohydrate accumulation because of water loss. Nevertheless, this might have afforded protection of the tissues since water loss slowed down and subsequent plant mortality was low, however, at the expense of delayed bud burst and decreased numbers of leaves formed. This resulted in low biomass production. Soil amendment with a hydrogel–EMF mixture partially compensated the negative effects of desiccation and stimulated biomass production of unstressed plants. This was most likely the result of structural protection of root tips ensheathed by EMF, improved plant water status, and enhanced nutrient uptake. Collectively, our data suggest that EMF and improved fine root water relations afforded improved nitrogen uptake from the soil and allocation to leaves, which in turn may have stimulated the formation of a larger photosynthetic area. Therefore, soil amendment may have trigged a self-enhancing cycle in which nutrient uptake from soil, photosynthesis at the whole plant level and below productivity positively affect each other. Overall, our results support our initial hypotheses since we found that soil amendment improved the plant water status and facilitated EMF colonization, thereby, improving N allocation and biomass production. We are grateful to the Bundesland Rheinland-Pfalz and to KLIFF (Klimafolgenforschung, Federal Government of Lower Saxony via the VW Stiftung) for providing financial support to the beech project and to the Deutscher Akademischer Austauschdienst (DAAD) for funding the doctoral research for R.S. Beniwal in the program “Integrated Environmental Engineering.” We thank C. Kettner, M. Fastenrath, M. Franke-Klein, and G. Langer-Kettner for the excellent technical assistance and the two anonymous reviewers for their help in amending this manuscript.